Bulgaria's parliament approved on Wednesday the nomination of Diana Kovacheva for new Justice Minister amid allegations of behind-the-curtain deals during her term as head of a local Transparency International affiliate. She was elected with 109 votes of MPs from the ruling majority. Forty-four voted against and 13 abstained. Kovacheva will replace Margarita Popova, who was elected in October as Vice President on the ticket of the ruling, center-right Citizens for European Development of Bulgaria party (GERB). "The government is awarding Kovacheva for keeping Transparency International silent during the recent elections. If it was not for the behind-the-scenes deals, the NGO was obliged to reveal all manipulations of the ruling party," Pavel Shopov, deputy head of the nationalist Ataka party, said from the rostrum. "It becomes more and more popular for organizations, whose job is to protect transparency, to operate with European money and run for public procurements instead, which is not at least relevant to their work," said leftist Yanaki Stoilov. His words were prompted by information that Transparency International, which Kovacheva headed in Bulgaria, received several hundred thousands levs from a state institution for the establishment of export strategies for products such as furniture, computer equipment, electrical machinery etc, which have nothing to do with the NGO activities. "It is more than clear that this activity will be reassigned to someone else," added Stoilov. According to the most outspoken member of the Socialist Party Maya Manolova the government is trying to benefit from Transparency International good image and cover up its blunders. "The organization's good reputation will be held hostage by the policy the government conducts in this field," Manolova said. The night after the elections runoff, on October 30, Prime Minister, Boyko Borisov, announced that the new minister won't be a Member of the Parliament and said, several days later, he would reveal the name on December 1. Borisov also stated on several occasions that the new Justice Minister will be a professional respected by EU institutions. Diana Kovacheva was born in Sofia, in 1975. She graduated with a law degree from the Sofia "Kliment Ohridski" University. Kovacheva had worked for the Institute for Legal Sciences at the Bulgarian Academy of Sciences (BAS). 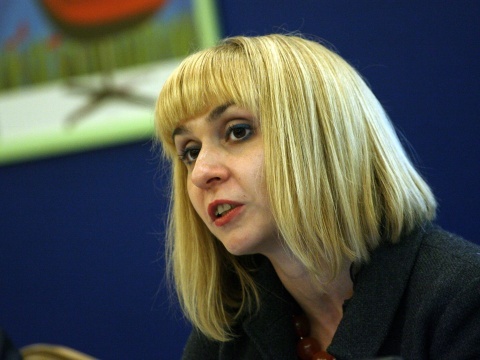 She became Executive Director of Transparency International Bulgaria in 2002. » Transparency International: Bulgaria Аgain Leader in the EU on a "Sense of Corruption"